Andrew Manze, the internationally known English violinist whom The New York Times has called "the Grappelli of the baroque," is doing a return engagement this summer at the Domaine Forget, on August 2 and 3. He will also be performing at the Festival de Lamèque on August 5. Manze is not only a highly accomplished chamber player but associate director of the prestigious Academy of Ancient Music based in London. He shared his contagious enthusiasm with us in a break between rehearsals. 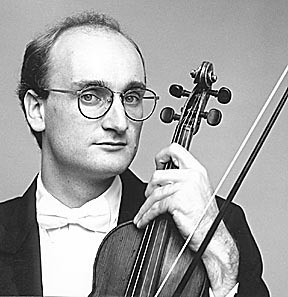 Andrew Manze mastered the violin gradually, almost as a dilettante. At the age of ten, after he had been playing the recorder for a few years, someone suggested that he should study a "real" instrument. His spontaneous choice was the oboe, but the orthodontist thought otherwise. He then opted for the practical solution of studying the violin - "the instrument in the house" (his father played it as a youngster). The school music program provided an admirable start. "By the time I was 11, I was already playing in an orchestra. I've played in orchestras ever since! At 14, I did my first international tour. When I was 18 years old, I was quite well travelled. It was a fantastic opportunity to learn orchestral technique on the spot." His love of baroque music developed during his studies at Cambridge. Even though he was studying classics (Greek and Latin), he continued to play the violin. His friend Richard Egarr (who will be playing with him at the Domaine Forget) had just discovered the harpsichord. He organized a baroque ensemble and persuaded Manze to try his hand. "It was a struggle at first but I'm glad now I discovered that repertoire. Richard is still talking to me and I'm still talking to him!" he chuckles. Other youthful encounters also transformed his life. The wife of the great harpsichordist, Gustav Leonhardt, took him under her wing. Mrs. Leonhardt, a musician herself, was "a wonderful guide," says Manze. In 1988 he met Ton Koopman, conductor of the Amsterdam Baroque Orchestra. "It clicked right away. We appealed to one another," Manze remembers. Koopman hired Manze then and there. He made his debut with the orchestra in the second violin section, but moved quickly to concertmaster. Manze left Amsterdam in 1993 to devote his time to conducting. He feels that freedom is a must for interpreting baroque music. "After all, when you are the first to play that repertoire, you can't ask anyone for input. The music was very much alive then and it still should be today. If a listener goes to hear a concert, we owe it to him to give a one-of-a-kind experience. If I were to play one piece the same way I did two months ago, it would be missing a key ingredient: flexibility. The performance obviously varies depending on how the musician is feeling. It should also depend on the venue you are playing in, its acoustics. It can be strongly affected by the character of the audience, how they react to the experience. For example, the German public take their baroque music very seriously, listening with great concentration. I look forward to playing in Canada, a nation I don't know very well. It's always interesting to feel, to experience an audience and find out what happens to the music as a result." Paradoxically, the essence of baroque music is somewhat defeated by its mass popularity, Manze outlines the irony of the situation. "We're asked to play in rooms way too big for the instruments, originally designed to be played in churches or small domestic venues." He remembers the Domaine Forget concert hall in great detail, and considers it an ideal venue. Asked why baroque music has become so popular in recent years, Manze suggested several reasons. "If the music is well chosen and presented in the right spirit, it is extremely good quality music. Bach can stand comparison to any of the major composers. The music is also extremely well structured, very melodic, entertaining and it has got drama to it." He draws a parallel with the attraction western civilization feels for novelty. "Music lovers are interested in new repertoire but they've been burnt by some contemporary music. They become wary of it. Maybe baroque music benefited from the fact that a lot of contemporary music is not accessible. It must be possible to write contemporary music which says all the things you want to say but doesn't provoke the 'yuck' feeling!" Manze doesn't entirely reject contemporary repertoire: on the contrary, his wife is actually a specialist in this rarefied field, and the Academy of Ancient Music has interpreted John Tavener's Eternity's Sunrise (in 1998) and Total Eclipse (June 20, 2000). Tavener is one of the most popular English composers of the day, and Manze appreciated being able to ask him about specific details of interpretation. In the process, he learned that composers are generally not dogmatic. "It's cowardly to justify oneself with an 'I ought to do this.' It's like hiding on stage behind a corpse. I always imagine what the composer would say if he were there. He probably wouldn't be concentrating on my question; he probably would be amazed by the technological progress. His music would be the last thing he would want to talk about." Manze's crowded schedule doesn't give him time for regular pupils. He enjoys master classes, however. "The questions asked by students are often the same questions I ask myself." Some of his former students have become fellow musicians at the Academy of Ancient Music, something he feels is a natural development. He speaks with great pride of "his" orchestra, which recently celebrated its 26th birthday. "The Academy of Ancient Music has achieved a great momentum. It is filled with great experience collectively. It took time to build the trust but now the musicians trust me completely. I don't quite know moment to moment what will be happening." Manze usually conducts from his position as concert master and seems becomingly modest about his personal prestige. He is looking forward to the orchestra's North American tour in November 2000. Chamber music remains an important part of his life as a musician. He spent 10 years with harpsichordist John Toll and lutist Nigel North in the Romanesca Trio. A number of award-winning recordings came from this collaboration. Manze had to give it up in 1999, when Nigel North accepted a post at the renowned Indiana University School of Music. His friendship with harpsichordist Richard Egarr reflects a similar meeting of minds on the artistic and intuitive level. Egarr will accompany Manze in August in Bach sonatas for harpsichord obligato and violin. Manze and Egarr have been exploring the rich baroque repertoire for 16 years now. "We love to surprise one another. It keeps the experience fresh and interesting," says Manze. Listen: 1. Sonata for Violin and Basso Continuo in G minor, Opus 1 no 4 "Devil's Trill"